ASPEN – Elvis watched the USA Pro Cycling Challenge on the Pitkin County side of Independence Pass, just below the summit. Moses was only a few hundred yards away, riding his bike near a steep cliff next to the Lake County line. 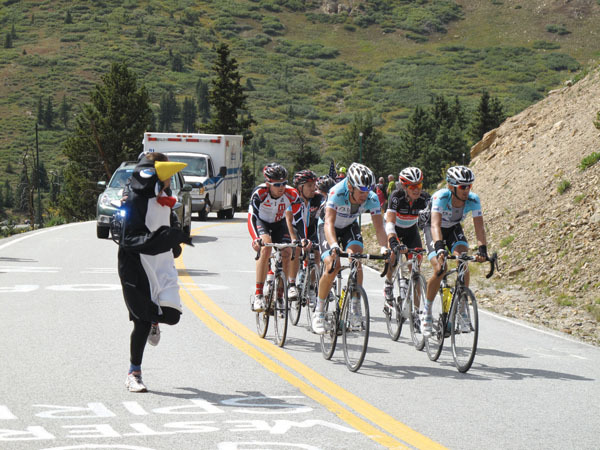 Fun-loving cycling enthusiasts also dressed as pirates, penguins and mushrooms. One guy even had the audacity to parade around in a union suit and a purple wig. Indeed, there was a carnival-esque scene at the top of the pass around 2:15 p.m. Wednesday as more than 100 riders made their way to Aspen after starting out from Gunnison earlier in the day. Those who watched the race both last year and this year between the switchback at mile marker 62, in Lake County, and the top of the pass at mile marker 61, in Pitkin County, said the crowds were considerably lighter this year and less festive, but they still enjoyed the race. “I was really disappointed with the lack of camping up here because I think it really limited the crowd,” said Pete Olson, of Colorado Springs, referring to the U.S. Forest Service’s overnight camping ban between mile markers 56 and 66, which put a damper on many a fan’s morning as they were forced to scramble for available roadside spots just after dawn. “But it was a great environment, and everybody seemed like they were having a good time and hanging out,” Olson said. With the cyclists climbing uphill on the Lake County side, fans were able to get a long look at the riders. “It was good to see Tejay van Garderen pulling through,” Olson said. “Tommy Danielson was looking strong.” Danielson and van Garderen finished first and 12th on Wednesday, the third of seven stages in the competition. Trego said he left Denver at 4 a.m. and got to his spot on the pass around 6:30 a.m. He said he might be able to make the race’s final stage in Denver on Sunday. “Everyone was in good spirits; it was a fun time,” he said of the festivities along the pass. Longmont resident Etienne van Tiggelen, a native of Belgium, also noted that the camping ban served to restrict the crowd this year. Dave LaSage, of Highlands Ranch, said this year’s event on the pass was better than last year’s, partly because of better weather. A light rain and gusting winds loomed over the inaugural event in August 2011. Wednesday’s weather on the pass was mostly cloudy with brief periods of sun and no precipitation. Aspen resident Trenton Allan said he enjoyed the race, as well, but was disappointed by the camping ban. At 3:45 a.m. Wednesday, he got to the same roadside parking area at the switchback where he camped for two days last year but was turned away by a state trooper helping the Forest Service enforce its ban. He returned to the spot at dawn, as the trooper instructed, but was forced to vacate the prime viewing area a couple of hours later by the Forest Service, along with about 10 other motorists and their friends who were sitting or standing peacefully or sleeping in their vehicles. A Forest Service employee at the site did not explain why daytime parking was prohibited at that paved spot other than to cite safety concerns. Soon after, law enforcement officials used the area to park their own vehicles. Race fans were allowed to stand at the spot but had to park elsewhere on the roadside; it was apparently OK for some vehicles to park halfway on the Highway 82 gravel shoulder and halfway on the tundra – the tundra that the Forest Service vowed to protect when it joined other local authorities, including the city of Aspen, in implementing the overnight roadside camping ban. “We just came up to have a good time and relax,” Allan said. “We thought we had all the information from the website and the newspapers, but the Forest Service just kept changing it up on us, constantly telling us to move, constantly telling us we couldn’t be there.